Any non-profit news startup (or for-profit, for that matter), faces a first-order challenge of sticking its head up and getting noticed. Put another way, the startup needs to find a spot in what is variously called the local news landscape or news ecosystem. 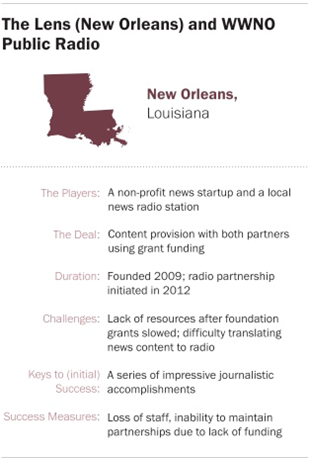 Markets don’t come any more newsy, treacherous and competitive than New Orleans, where a mid-sized investigative unit called The Lens with a $700,000 annual budget has been steadily working to define its presence and raise its profile since its founding in 2009. The founding built off of Karen Gadbois’ successful work as an independent blogger on the misspending of Katrina recovery funds and the neglect of historical preservation in rebuilding efforts. Her blog posts on the issue caught the attention of TV investigative reporter Lee Zurik, and the pair produced more than 50 stories over two years which led to federal indictments and won top national prizes. That work in turn sparked the creation of The Lens. “It was as if somebody in bunny slippers had hit a home run the first time at bat,” editor Steve Beatty said. In casual moments, Beatty will describe his approach to partnering as “promiscuous.” He has gotten together with multiple collaborators on various platforms—making Lens content available, for instance, to both the established Times-Picayune and its NOLA website, while also doing business with The Baton Rouge Advocate, which now publishes a daily New Orleans edition. The Louisiana Weekly, targeted to minority populations, is another prime outlet. 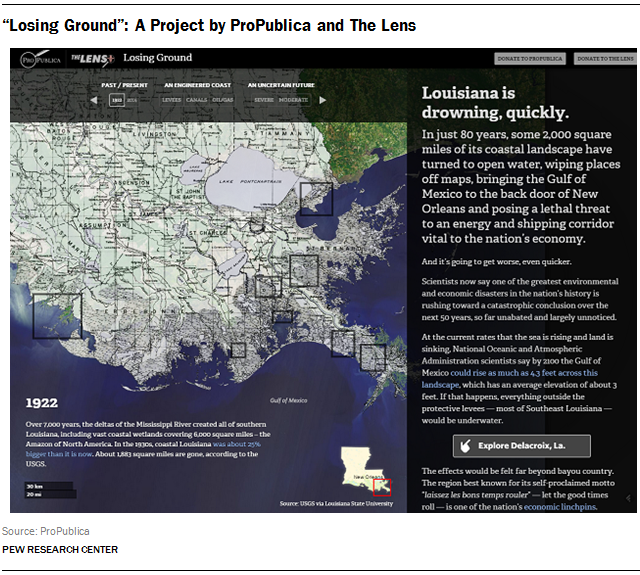 The Lens also collaborated with ProPublica this fall on a big project titled “Losing Ground” (but in a different sense from the Colorado I-News project of the same name). With maps and aerial photos (from ProPublica) and on-the-scene reporting by The Lens, the project gave a vivid picture of the startling erosion of coastal Louisiana over decades. Despite journalistic successes, The Lens nonetheless began experiencing financial challenges in late 2013 as initial foundation grants lapsed and new ones were slow in coming. Those struggles have, at least for now, stalled one of its most promising partnerships. Beatty had determined that he wanted one lead partner to stabilize and grow, while maintaining other relationships that gave the work wide exposure. With encouragement from a Knight Foundation grant, he pursued a partnership with the city’s public radio station, WWNO, itself beginning a big shift to an all-news/talk format while phasing out music programming. Beatty and his counterpart at the station, news director Eve Troeh, agree that both sides have benefitted journalistically. But, the resources are not there to ramp up to a full merger on the model of the Colorado I-News network or the St. Louis Beacon’s absorption into St. Louis Public Radio. And without a sense of further ways to grow the partnership, the energy to keep it going waned. The partnership ramped up with a Knight grant of $20,000 to hire a part-time producer to help Lens staff adapt written stories to radio. “We’ve learned that doing radio is more than just rewriting your print pieces,” Beatty explained. His writers did get better but did not necessarily evolve into outstanding radio presenters. One solution has been to leave the more complicated narration and production to professionals while using Lens writers for so called “two-ways”—anchor chats about their stories. For WWNO, the collaboration, if not perfect radio production, provided a lot of strong content at a time when the station urgently needed it. News director Eve Troeh, formerly a national Marketplace beat reporter for NPR, came aboard in April 2013 tasked with building a news department from scratch. It was not until fall of 2014 that she was able to hire a second reporter. The Lens, she said, has contributed a steady stream of reports in the adapted-to-radio format along with “lots of information we could use to flesh out and report general news.” A WWNO series on standardized testing “built on Lens reporting as a starting point.” And the partners produced a segment on the continuing aftermath of the B.P. oil spill and gulf pollution that aired nationally on NPR’s Weekend Edition. Some bumps remained, Troeh said, in fusing print and radio news cultures. But the arrangement stalled out essentially for financial reasons. Both entities were relying on national foundation grants, drawn by the well-publicized cutbacks at The Times Picayune as it switched to an online-first strategy and stopped publishing a print edition several days of the week. And several of those grants were expiring. That left the two competing for some of the same sources of funding. And Troeh was in the awkward spot of being asked to spend more to build the partnership while the operation she was tasked with developing was barely getting its own legs. In the summer of 2014, the two concluded that due in large part to finances, the momentum for a deeper collaboration or a merger wasn’t there—though both she and Beatty consider this more a hiatus than a split. The Lens was forced to lay off one of its reporters early in 2014 and had to discontinue, for now, a commitment to covering every meeting every month of charter school boards with a network of freelancers. In fall of 2014, managing editor Steve Myers accepted a visiting professional position at Texas Christian University in Fort Worth, dropping down to a part-time projects editor at The Lens. Co-founder and staff writer Karen Gadbois has temporarily suspended her blog to help Beatty focus on business issues. Even with the reductions, The Lens remains formidable journalistically. The ProPublica collaboration, published this September, is a marker of that. The national investigative site brought a capacity for mapping and aerial photos to present the story of more than a century of erosion in a format that was mainly visual rather than traditional text. The Lens contributed star reporter Bob Marshall, who had a hand in two Pulitzers as a wildlife writer and sports columnist at The Times-Picayune, before leaving at the time of the digital switch. By his own account, Marshall had been tracking the disappearance of coastal lands for four decades. The Lens has also been able to coordinate a series of local forum events to extend the reach of the project. But the biggest yet in a series of editorial successes unfortunately doesn’t equate to financial stability. Beatty said that his current annual budget mix is $500,000 in national foundation support, $175,000 from local foundations and $60,000 from individual donors. He hopes to build the individual donor base, attract $100,000 in new underwriting and sponsorships and sell content to partners. “We’ve reached a point in our development in which we can no longer afford to give it away to everyone,” he said. Just as this report was going to press, Beatty said that he has made progress on several fronts. The Advocate is now paying for Lens stories and the Hechinger Institute, an education nonprofit based in New York, is paying to use its charter school coverage. Beatty also said that he expects a large national foundation grant to underwrite operations. So the prospects for sustainability have brightened in recent months, but The Lens, like many a maturing non-profit, still faces a big challenge to find a stream of money to match its journalistic opportunity. Partnerships will be integral to that effort, but right now the details remain to be determined.